Published Sep 1991 by Harvey. Cover art by Jorge Pacheco. 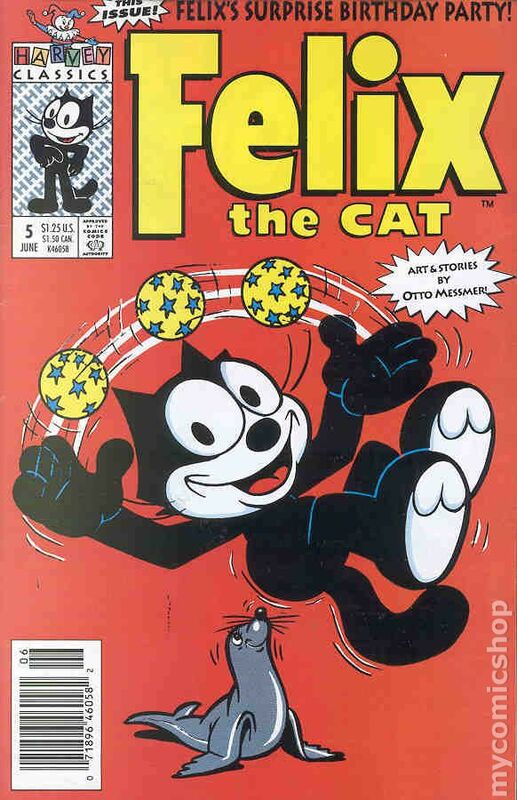 Get a Job, script and art by Otto Messmer; Felix gets involved in selling pre-made holes. The story is three 5-page chapters. Chapter 2 is titled The Magic Hole. Chapter 3 is titled A Hole-y Mess. Untitled Inky and Dinky story. 32 pgs. $1.25. Cover price $1.25. Published Nov 1991 by Harvey. Signs o' Summer; Felix has trouble obeying signs. Seasick; Felix and a friend go sailing. Two Gun Timmy. Inn Business; Felix buys a hotel because the circus is coming to town. Scripts and art by Otto Messmer. 32 pgs. $1.25. Cover price $1.25. Published Jan 1992 by Harvey. Cover art by Jorge Pacheco. 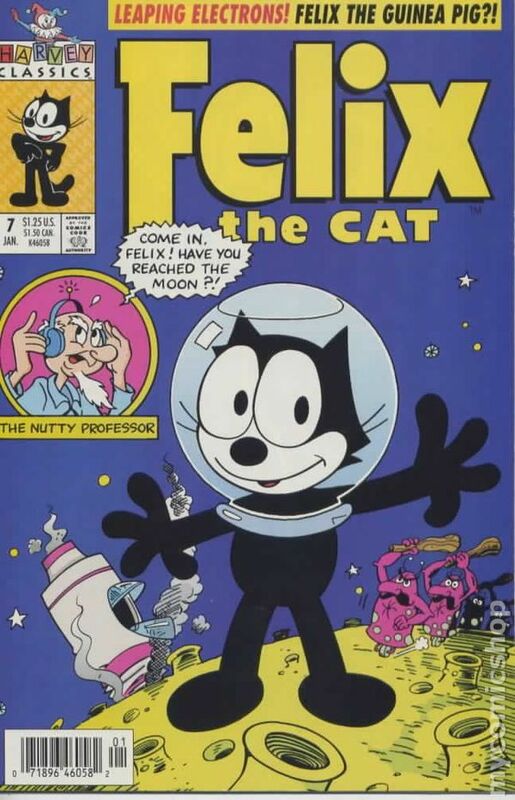 Mines for Fines; Felix becomes a uranium prospector. Felix Hunts the Hunter; Delivery boy Felix has trouble delivering a letter to a big-game hunter. 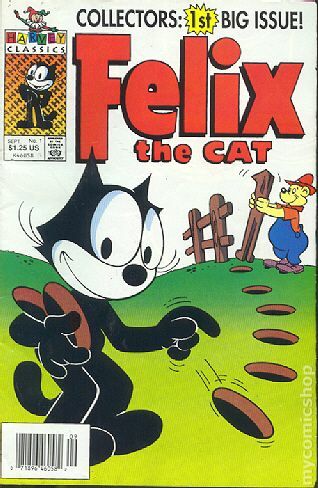 Felix Goes to Town; Felix can't decide weather to vacation in the big city or the countryside. Scripts and art by Otto Messmer. 32 pgs. $1.25. Cover price $1.25. 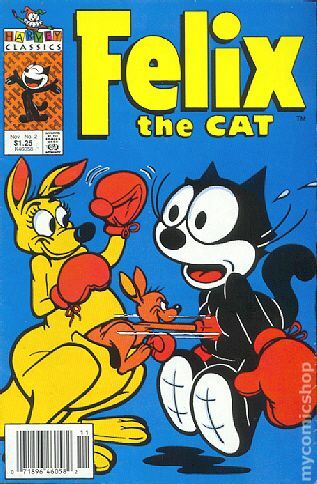 Published Mar 1992 by Harvey. Cover art by Jorge Pacheco. The Shutter Bug; Felix takes up photography. 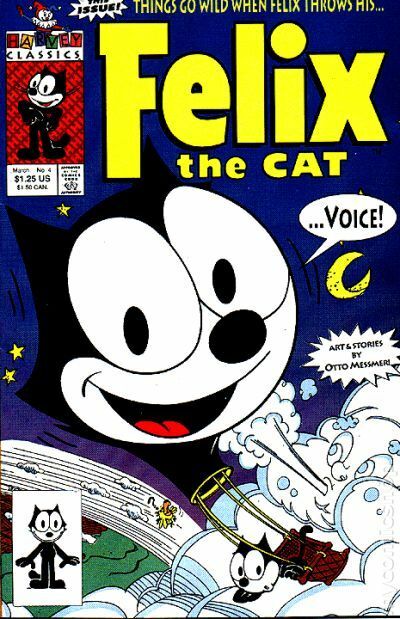 Voice Luck; Felix learns ventriloquism. Scripts and art by Otto Messmer. 32 pgs. $1.25. Cover price $1.25. Published Jun 1992 by Harvey. The Pied Piper; Felix becomes a plumber. Felix and the Merry Midgets; The Merry Midgets must get ready for Felix's party. Scripts and art by Otto Messmer. 32 pgs. $1.25. Cover price $1.25. Published Sep 1992 by Harvey. Cover art by Jorge Pacheco. 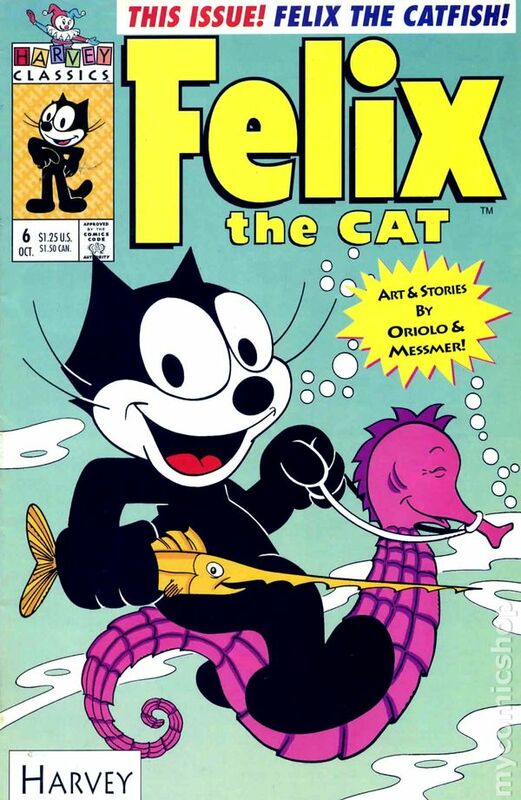 Out to Launch, script by Otto Messmer and Joe Oriolo, art by Joe Oriolo; Felix tries to get a pearl necklace for Kitty. 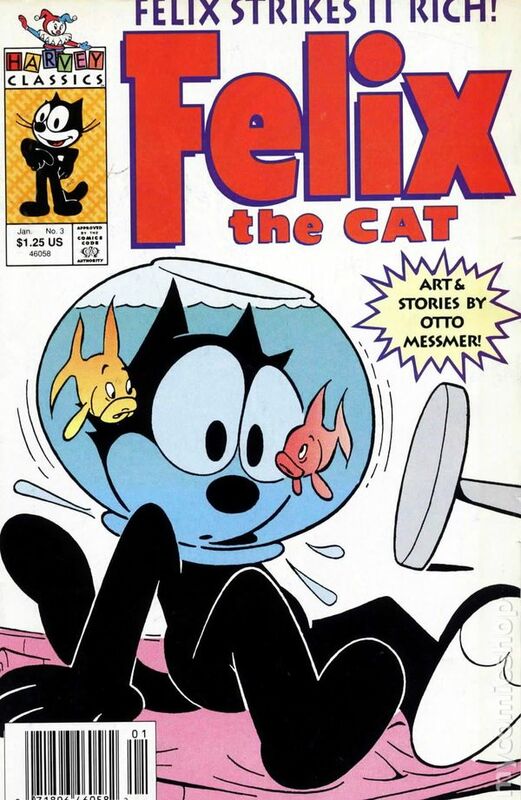 Under the Sea, script by Otto Messmer and Joe Oriolo, art by Otto Messmer; Felix explored the sea bottom for pearls. Pearl-sonality!, script by Otto Messmer and Joe Oriolo, art by Otto Messmer; Felix finally finds some pearls. Round Trip, script and art by Otto Messmer; Inky and Dinky go to the airport instead of doing homework. 32 pgs. $1.25. Cover price $1.25. Published Jan 1993 by Harvey. Cover art by Jorge Pacheco. The Haunted House, script by Otto Messmer and Joe Oriolo, art by Otto Messmer; Felix explores a haunted house and finds a mad scientist. Heavenly Daze, script by Otto Messmer and Joe Oriolo, art by Joe Oriolo; Felix takes a trip to the moon. Untitled Inky and Dinky story, script and art by Otto Messmer. Out Spied!, script by Otto Messmer and Joe Oriolo, art by Joe Oriolo; Felix guards the plans for the rocketship. 32 pgs. $1.25. Cover price $1.25.